As an owner of an Airstream RV, you’re probably aware of how well made these travel trailers are. Even the oldest models of Airstream camper trailers are still highly valued and sought after. If you are fortunate enough to find one of these beauties at a reasonable price, it is worth investing in as they will only increase in value over the years to come. 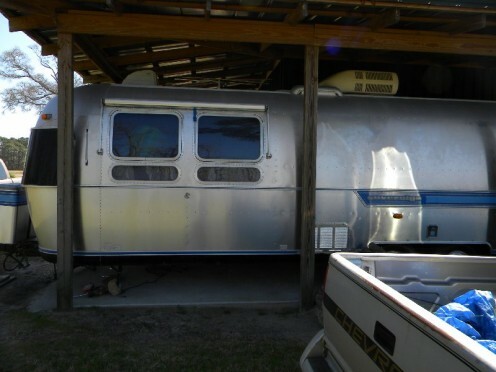 These Airstream RVs can be repaired and maintained for many, many years. But like any other RV or camper trailer, there are some parts of the Airstream travel trailers which need to be maintained or repaired occasionally. The Airstream rooftop AC should be cleaned and oiled on an annual basis after the first couple of years in order for it to give reliable and efficient service. 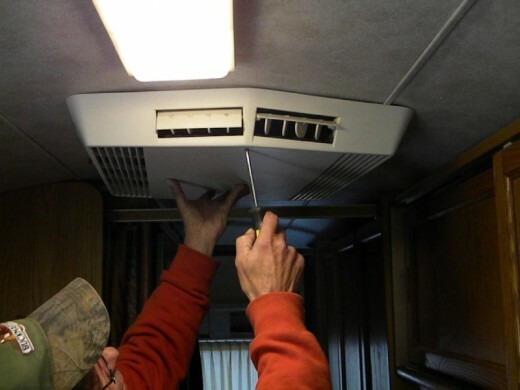 This article tells you how to clean, maintain, and repair your Airstream RV AC for dependable and efficient cooling. This is not a very difficult job to perform, even for a beginning troubleshooter. Although the rooftop RV AC illustrated in the article photos is a Coleman Mach AC, it is representative of most other brands as well. 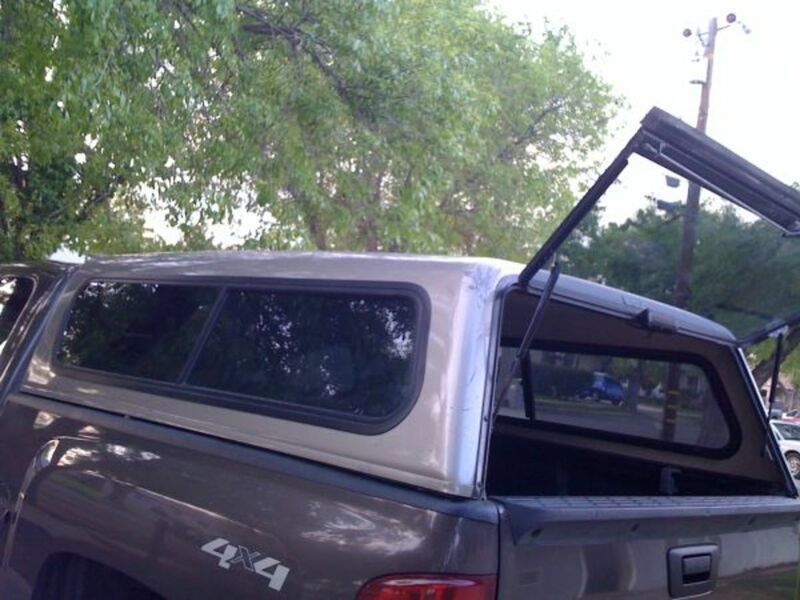 Carrier, Dometic, and Duotherm rooftop RV AC units all use the same configuration as the Coleman RV AC depicted here. You may have any of these RV AC units on your particular Airstream travel trailer. Even if you don’t use your Airstream travel trailer often, the rooftop AC still needs to be maintained regularly. For more about maintaining RV AC units in general, read more about maintenance and troubleshooting. 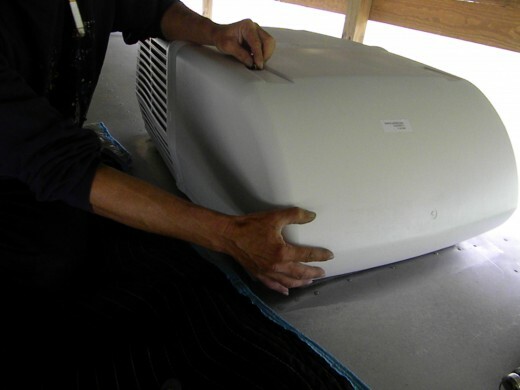 To service the Airstream RV AC unit it is necessary to remove the shroud form the rooftop AC unit. It is recommended that you use a soft blanket or drop cloth while working on this area of the Airstream roof to protect the aluminum skin from dents and scratches. Use a pad beneath any ladder or scaffolding for the same reason. 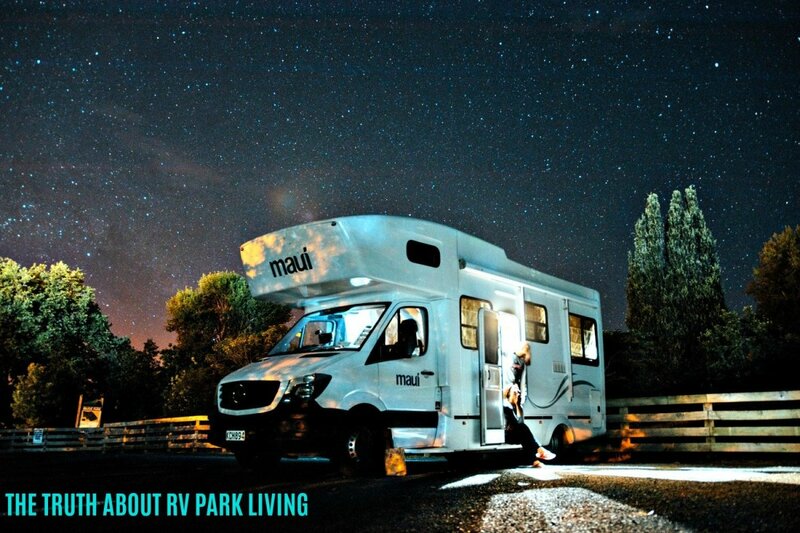 Before working on the RV AC, be sure to disconnect the electrical power from the unit, either by turning the breaker off, or by unplugging the Airstream itself. After you have succeeded in removing the four screws which attach the RV AC shroud from the rooftop AC unit, you will be able to observe which type of bearings your RV AC fan motor utilizes: sleeve ball bearings or sealed ball bearings. Most RV AC fan motors have one or the other. Even though these motors with sleeves don't have oil ports, they need to be lubricated. Applying a drop or two of a good machine oil to the sleeves every so often will delay having to replace the RV AC fan motor for a long time. The photos below will show you the difference. As you can see, the sealed bearing AC fan motor has places to drop in the oil right above the shaft on both ends of the RV AC fan motor. Most have a small tube in which to administer the oil to the bearings. Sometimes this tube will fall out or just crumble away, but you can still put the oil directly into the small opening on the face of the AC fan motor. Spin the fan while you are filling the oil tube so the oil is properly displaced. Getting to the AC fan motor bearings on the front of the unit may require you to loosen the support bracket and retaining screws. Be sure to mark around the support bracket and the screws holding it down in order to replace it in the right position. 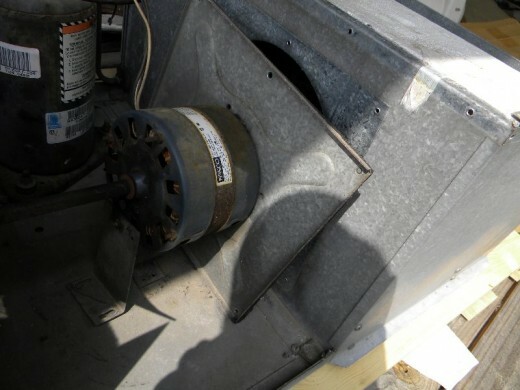 Otherwise, the fan may not be aligned correctly and may scrub the AC housing. If the fan still seems to start sluggishly or requires a spin by hand to get it going, it is time to rebuild or replace the fan. A bad starting capacitor may be the culprit but you can usually tell if a bad bearing is causing the fan to not spin freely. 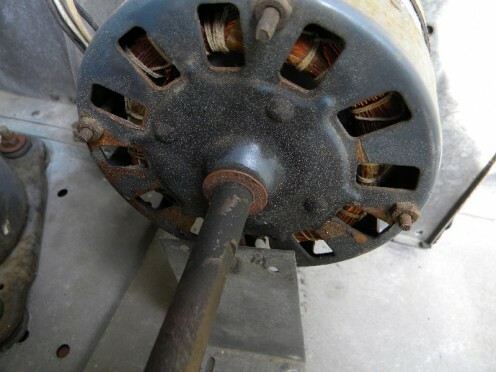 A sealed ball bearing RV AC fan motor may be rebuilt for a reasonable price, but in many cases a sleeved-bearing RV AC fan motor cannot be repaired for much less than a new RV AC fan motor would cost. 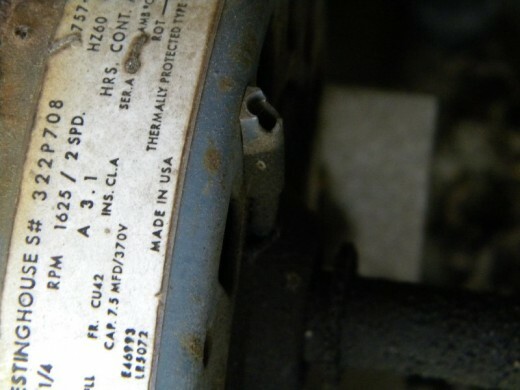 The fan motor shaft is usually damaged beyond repair. RV AC fan motor with sleeve bearings. Drop oil around bearing on shaft. Rear view of sleeve bearing AC fan motor. Condenser cover removed. Oil the bearing at shaft. Ball bearing RV AC fan motor. Notice the oil tube. Repair the AC Fan Motor or Buy a New AC? 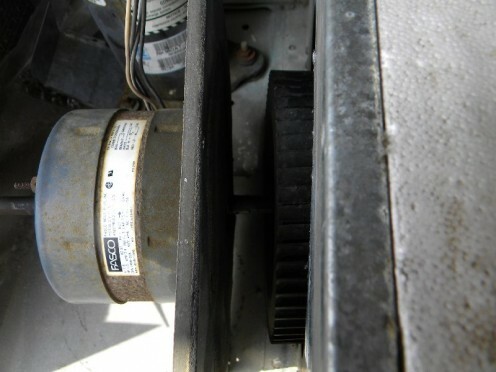 In many cases, it is better to buy a new AC fan motor rather than having the old one rebuilt. Before putting too much money into buying a new motor you may want to consider if you had rather just buy a new rooftop RV AC unit. 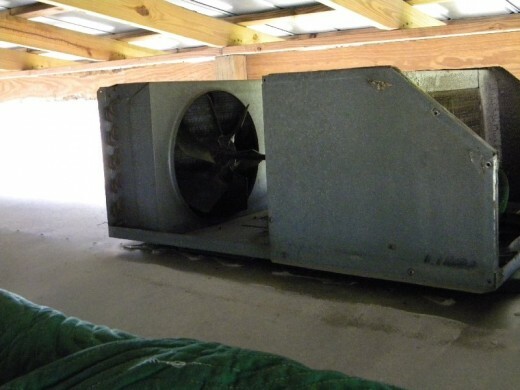 It depends on how old your old AC unit is and how well the compressor is cooling the air. A new RV AC unit is often the best choice for Airstream travel trailer owners with an old RV AC unit, as repairing the old AC unit may cost almost as much as a new one. The new 13,500 but roof top Coleman AC unit we installed into this 86 Airstream Sovereign only cost about $550. A new RV AC fan motor can run over $200 including shipping. Do your homework on this one. 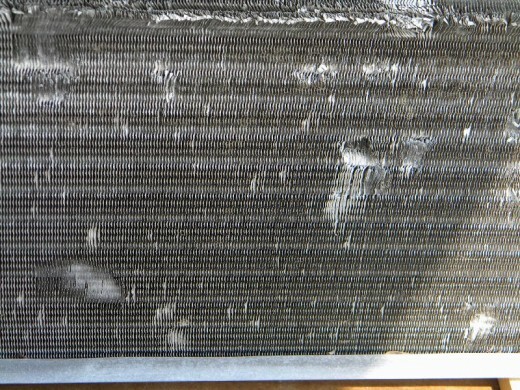 After a few years of use the RV AC evaporator and condenser coils will start to accumulate dirt and grime in the fins. If not cleaned, they will inhibit the airflow needed to cool the Freon and displace the heat from inside of the Airstream. As you can see from the photos, the coils in the old unit needed cleaning badly. Soaking the AC coils with 409 or the special foam coil cleaner and then removing the softened residue with a wet/dry Shop Vac will usually work well and not create too much of a mess on the Airstream roof. Compressed air does even better but tends to get the grime everywhere. 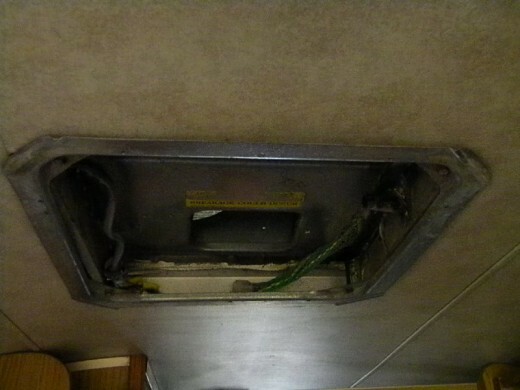 Also be aware of the duct opening down into the interior of the Airstream. By using a vacuum cleaner, you avoid having the grime seep down into the interior AC ceiling assembly. Be careful not to press the vacuum tip hard against the fins of the AC coils as they are very easily bent closed. A "fin brush" can be used to straighten out any fins which are inhibiting the efficiency of the air flow across the RV AC coils. If possible, clean the AC motor fan blades themselves. These blades are easy to access and clean (see below). 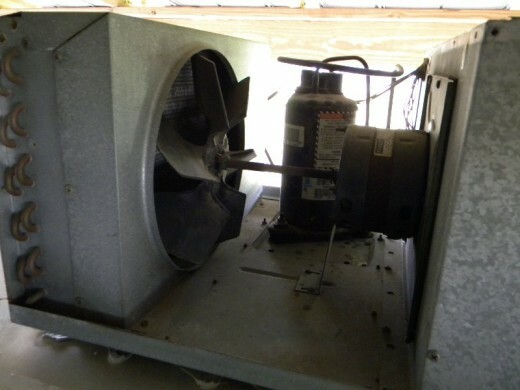 The AC condenser fan motor blades cannot be accessed without removing the AC fan motor from its support brackets and pulling it out of the unit. 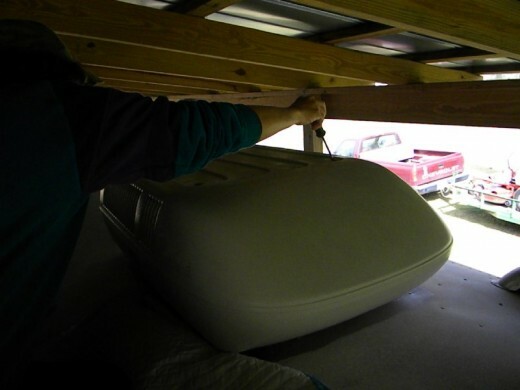 An alternative and sometimes easier method is to remove the AC ceiling assembly from the interior of the Airstream travel trailer. Once the AC ceiling assembly has been removed, the fan can be cleaned with a small brush and most any household cleaner. Reassemble when the cleaning is done. If the RV AC unit on your Airstream travel trailer has a drain for removing the excess humidity—check to see if it is clear and drains properly. A plugged drain could cause leaks to penetrate the Airstream roof and the AC duct itself, causing water to drip down onto the floor or onto the occupants themselves. Barring a malfunctioning AC compressor, your Airstream AC unit will give you many years of efficient cooling before having to be replaced. The maintenance and repairs suggested here will ensure you will get the most out your RV AC unit for many years to come. 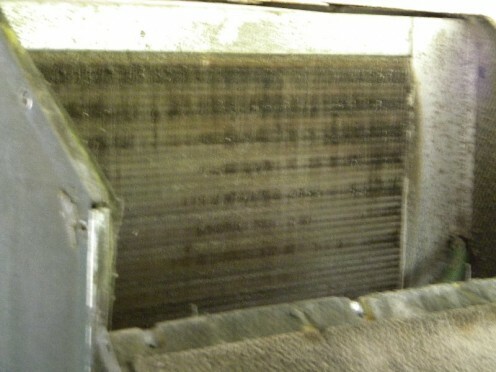 Once you understand the annual maintenance routine, it doesn’t take very long to service the Airstream AC unit. A few ordinary hand tools are all that’s required for this very important maintenance procedure. You can do it. Don’t be afraid to try to you will learn more than you expected. Good luck! Julio, either replace the capacitors or have them checked first. An easy and relatively inexpensive task in most cases. You can do either, GT! Although it is better to use padding under a ladder to reach onto the top your Airstream, you can carefully rest your weight atop the riveted areas which are supported by the metal ribs. Is it okay to climb on top of the Airstream, or do you just work from a ladder or scaffold? Thanks, Holle. I try to make it as easy as I can for the owners of the RV. I like the way you walked readers through the process! Great hub! There are many old Airstreams still on the road, Gus. I've been trying to find an old Bambi to renovate but so far, no luck. Even the old Airstreams are still costly. Good to hear from you and thanks for checking out my hubs. Hi Randy - You got it right. Once an Airstream, always an Airstream. About 70 years ago our neighbor had an Airstream. Betcha the thing is still rolling. No ACs back then, but if it is still on the road, someone has no doubt stuck an AC onto its top or at the rear window. I hope it helps those with an Airstream RV! A well written and explained hub. Thank you. Hey Earnest! You're right, the same tips will work on many home AC systems. Thanks for reading and commenting! Hang loose! Great hub Randy. Some of the tips are useful for any air-conditioning unit as well as the one fitted to the Airstream travel trailer. I really appreciate your info about the google search in your country and your comments on this hub. Thanks, Mumbai! It is a great hub, no wonder it ranked #1 in 13 minutes. Congrats. Thank you for commenting PDH. Glad to be a fan of yours!